I am a huge basketball fan, indeed, sports fan in general. Since I am also a Christian philosopher, people have often assumed that I must be a fan of John Wooden, the legendary coach who won numerous national championships at UCLA. In fact, however, I am not, and people are often surprised when I tell them so. They are often even more surprised when I go on to tell them that I am big fan of Bob Knight, also known as the General, an equally legendary coach who won three national championships at Indiana. How can I admire the hothead who is infamous for throwing a chair during a game more than the elegant “Wizard of Westwood”? I have answered that question in detail in an essay entitled “The Wizard Versus the General: Why Bob Knight is a Greater Coach Than John Wooden.”[i] Here I will briefly give the two main reasons. First, Knight won with far less talent than Wooden. Whereas every one of Wooden’s teams had at least one player who went on to become an NBA all-star, including some of the most dominant players who ever played the game, Knight had only one player who became an NBA all-star. That player was Isiah Thomas, a 6’1” guard who played only two years at Indiana, but led them to the national championship in 1981. Knight had many excellent players to be sure, and he is famous for getting the best out of them, but the talent level of his players was not even close to that of the players Wooden coached. A good example is Steve Alford (the current coach at UCLA), a player who did not have NBA caliber athleticism, but who was a two time All America for Knight, leading Indiana to the national championship in 1987. But the second reason I consider Knight a greater coach is the truly decisive one for me. Whereas the General was staunchly committed to playing fair, the Wizard succeeded with the help of a booster named Sam Gilbert, a corrupt businessman who provided a variety of benefits to his players that violated NCAA rules. To be sure, Wooden won at a level no one likely ever will again during his tenure at UCLA. Wooden was hired in 1948, and won no championship during his first fifteen years as head coach with the Bruins. Then, amazingly, after fifteen years with no championships, he won 10 in 12 years in the period from 1964-1975. What changed? Well, during this period UCLA’s recruiting was elevated when a steady stream of the top players in the nation chose to play for the Bruins. Many think this was all due to Wooden’s famous “Pyramid of Success” but the Gilbert Factor was no doubt a significant part of the equation that explains why his fortunes turned so dramatically during those dozen years. To be fair, Wooden won a couple championships before Gilbert got involved with the program, and had some outstanding players on those teams. But the recruiting elevated and remained at an exceptional level during the next several years when UCLA dominated college basketball. Victory bought at the price of cheating is a hollow affair. Worse, it is a form of theft. It steals the honor and glory from those who played by the rules, and who would have won if everyone had played fair. And it steals the joy of celebration from the fans of those who played fairly. I cannot admire Wooden’s record breaking accomplishments for the same reason I cannot admire those who hit record numbers of home runs, or win Tours de France by using illegal performance enhancing substances. Here is what I find curious and deeply ironic. Everyone who knows anything about sports knows Bobby Knight threw a chair, but even among fairly well informed fans, few know, or care, about Sam Gilbert. So what does this have to do with what’s wrong with America? Well, a couple of things. First, it is an interesting window into the fact that our culture is more inclined to assess things in psychological terms than moral terms. Our culture is far more concerned about personality and good manners than it is about character. Indeed, it is more important to be likeable and gracious than it is to be honest. For us, after all, image is everything. This is true in our culture everywhere from the basketball court to the highest levels of politics, where likeability counts far more than honesty. Wooden was gracious and gentlemanly, even a grandfather figure. Knight is blunt, gruff and temperamental. Our culture is accordingly quick to judge Knight but prone to ignore altogether the shadow of Sam Gilbert when assessing Wooden because it is far more concerned with personality than character. To me, the answer is clear. This is not to suggest Knight a saint . Indeed, I would guess he will need some time in purgatory before he will be ready for that honor. Nor is it to deny that his own character flaws have marred his illustrious career. But Knight’s flaws do not detract from his greatness as a coach even remotely as much as the corruption that Wooden ignored detracts from his. And I would contend that to think otherwise, you must have developed quite a taste for swallowing camels. [i] In Basketball and Philosophy: Thinking Outside the Paint, eds. Jerry L. Walls and Greogry Bassham (Lexington, KY: The University of Kentucky Press, 2007), 129-144. « Why Do Children Embrace or Reject the Religion of their Parents? Why conflate what Gilbert allegedly did, with recruiting, which no one alleges Gilbert had anything to do with? There are two new books on Coach Wooden: one by a college professor, which I have thoroughly read; the other by a Sports Illustrated writer, which I am reading. Neither found any Gilbert involvement in recruiting. No one ever has. The professor’s book states Michigan State was ready to out-and-out buy Lew Alcindor and Lucius Allen. We have to keep that context in mind. The facts, if I remember them correctly, are that Coach Knight was fired by the university president and then quit on his new team mid-season after passing some win milestone. The NCAA, although it was sanctioning teams right and left at the time, never sanctioned Coach Wooden. A Stanford professor wrote a book contrasting Coach Knight with Coach Wooden; her thesis explained, quasi-scientifically, why Coach Wooden succeeded in every way, and why Coach Knight did not. The book is called Mindset. Swen Nater, who is the only person connected with UCLA that Coach Knight ever had anything good to say about (I unfortunately read the main book about or by Coach Knight, and he has a lot of grudges), was specifically cited in the Stanford professor’s book, and in Daniel Coyle’s The Talent Code. Along with Mr. Nater’s own book, You Haven’t Taught Until They Have Learned (the co-author is a UCLA professor), I believe this is where people find the answer to how Coach Wooden succeeded, which is not the same as winning. He was a teaching genius. Coach Wooden also was the influence on the foremost expert in teaching methodology, who was a professor at UCLA. Her name escapes me, but anyone who became certified as a teacher knows or knew her name. It’s hard to see what Coach Wooden had to gain from Gilbert. Gilbert wasn’t in Indiana when John Wooden had an illustrious high school and college academic and basketball career, nor when Wooden played professionally; Wooden is in the Hall of Fame both as a player and as a coach. Wooden lived in a modest condo after retirement and never made more than approximately $35,000 at UCLA. Coach Wooden won the Big Ten’s top academic award as a player, and was awarded our nation’s highest civilian award, the Presidential Medal of Freedom. John Wooden wasn’t the only great person in his family; his father Joshua qualifies as well. John Wooden also had a great wife. I don’t know much about Coach Knight other than one of the very greatest college and professional basketball players left Indiana and was never going to play basketball again, Larry Bird. I also witnessed some of Coach Knight’s outbursts when I was trying to watch a college basketball game. Digger Phelps said what Coach Knight said about Coach Wooden. Perhaps Digger Phelps would have been a better choice for your thesis than Coach Knight. Jerry Tarkanian might have also said the same thing. I don’t believe Pete Newell did, though, but Pete Newell was the only one with a winning record against John Wooden. Coach Knight was a reserve on the Ohio State team that played Pete Newell’s California Bears for the championship. John Havlicek stated the fact Coach Knight never started had quite an effect on him. I don’t know how well Coach Knight did academically. I would like to know these things before agreeing America should emulate him. I did read the main book by or about him, and I thought he came off as a small person, full of grudges. I don’t believe Coach Knight was ever able to defeat Coach Wooden, and they were opposed in some high-stakes tournament games. Coach Wooden did have to defeat several teams in the Final Four that were fresh off probation or about to be placed on probation. One year, every coach complained about Florida State cheating. Every coach but one, John Wooden, whose team simply defeated them in the championship game. You Sir live in la la land.It has been proven and admitted to by Sam Gilbert himself that cars cloths and “walking around money”were all provided to UCLA players. As a disciple of Jesus Christ, a high school football coach, and someone who has studied both coaches I would have to disagree with your assessment wholeheartedly. Coach Bob Knight is one of the greatest basketball minds to ever coach, perhaps the greatest with his invention of the motion offense. The biggest problem I have with Coach Knight is his ego and the fact that he asked his players to do something which he himself could not do. His choking of Neil Reid cannot in any way be justified by anyone. I would have a serious issue with any coach who choked my son for any reason. He wanted them to be disciplined, while he could not maintain self-control. You say that because he was a stickler for the rules you admire him and his attention to moralism. Do you value rules over relationships? This seems to me what Jesus was most wholeheartedly against in his teachings. I would submit to you that this moralistic behavior is what drives the unbeliever away from a relationship with Christ. For the commandments say, “You must not commit adultery. You must not murder. You must not steal. You must not covet.” These—and other such commandments—are summed up in this one commandment: “Love your neighbor as yourself.” Love does no wrong to others, so love fulfills the requirements of God’s law.” ~ Rom 13:9-10 Do you value rules over relationships? You sound like a very religious man. Coach Wooden on the other hand, according to every account I’ve read by those who coached and played for him, lived out his faith. He coached with love, and believed that this was superlative to fear-based coaching. According to every thing I’ve read about the God of Abraham, Issac, and Jacob, my God is a God of love. Could God break me at any moment and force me to believe in Him? Absolutely. But He did not. Instead He wants to establish a relationship with me, not based on my adherence to rules and my behavior. The rules exist and were given because He loves us. Finally, you state that you do not like Coach Wooden because of the actions of Sam Gilbert and you suppose to know what Coach Wooden did or did not know. You sound like a man who is able to judge the intention of others and what is in their hearts. You sir, are unqualified to do that. As am I. That is God’s domain. Tread lightly my brother. James, I think that Christ would have much more trouble with what UCLA was doing if he could have seen it. They violated the rules purposely, and the NCAA ignored them. For example, UCLA’s players had sports cars, and Long Beach State’s players only had bicycles. Guess which program the NCAA investigated? To understand Coach Knight, one should read the book, “Bob Knight: His Own Man” by Joan Mellon, an English professor at Boston University. I read it while becoming a teacher of Spanish at the secondary level. I had hoped to become one half of the teacher that Coach Knight was. I know one of the”Flies on the Wall” on the firing of Coach Knight. It was a hatchet job. A secular progressive religious institution that Indiana University became under Miles Brandt could not permit a man to correct the behavior of an adolescent. This was the gist of the firing. The retirement was planned, not spontaneous. He had his successor in place and everyone was aware. 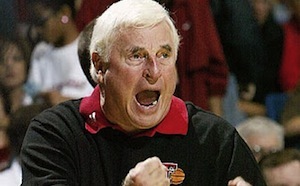 As far as emulating Coach Knight? Difficult at best. He was his own man and that is if not dead, a dying breed in these soon to be late great United States. He had the mouth of a sailor according to a friend who sat behind the bench at IU games. He never explained the chair but did say sometimes he regrets it when the chair is half way cross the floor. As for Wooden, Mellon reveals additional troubling information: that he routinely threatened to have referees fired. He was not the modest gentleman on the court as portrayed. And that he let someone like Gilbert roam free with his players smacks of plausible deniability at best and at worst cries out hypocracy. I played against Wooden and UCLA twice in the NCAA Tournament. I later took up coaching and studied as many coaches as possible, deeply, in order to become a better coach myself. I now teach an Ethics class. I use Wooden as an example….NOT a good example. I wanted to play for him, I thought I wanted to coach like him, but the more I learned, really learned, the more surprised I was. Wooden was on his way out in 1959-60 with a 14-12 record and having had Cal (Pete Newell) take him to the woodshed repeatedly over the years. He hired Jerry Norman, a ‘recruiter’, in every connotation of the word. Norman had been a player at UCLA with the first NBA player, Willie Nauls, and Naulls was the first documented relationship with Sam Gilbert. Walt Hazzard chose UCLA because of Naulls. And that started it all. Players, not philosophy, changed. First, Wooden claims in a devotional/biographical book that he never considered retirement until after the semi-final game in 1975. That is a lie. Like many of his lies, he insists so strongly that it makes one believe nothing else could be true. The fact is, he announce his retirement before the regional final game against Arizona State. How do I know? I played on Arizona State and after the game Dave Meyer came up on our bus and told us that they had been really psyched since Coach Wooden had told them before the game that he was going to retire. You do not ever forget anything like that. I remember it like it was yesterday. Also, the same game, UCLA and Wooden’s claim that they never scouted. Our locker room that day was the one UCLA used the game before against Montana State and there in plain sight was there mimeographed scouting reports for their game against Montana State. Nobody used written scouting reports back then, but there was ‘never the scout the opponent, UCLA’ scouting report in plain sight. Wooden knew. Wooden did not start winning big until Jerry Norman started ‘recruiting’. Wooden no doubt may have been a fine man and teacher, etc. BUT he did not start winning until he started cheating, or allowing it. I could go on. Nobody will pay much attention to this, How can this be true??? I am convinced, as I also am with Coach K, these guys were headed south in a hurry and the only thing that saved them was finding players…and they found them by cheating. Another claimed Christian who is — wait for it — a hypocrite. Knight’s current disgusting comments about his employers at IU — that he wishes they were all dead — is part of the cloth of a profane bully. Wooden was informed by his religion and taught his teams Judaeo-Christian values. Knight not a whit.